We are defined by the choices we make. In the case of our DSE alumnus Ramya, the choice was clear. 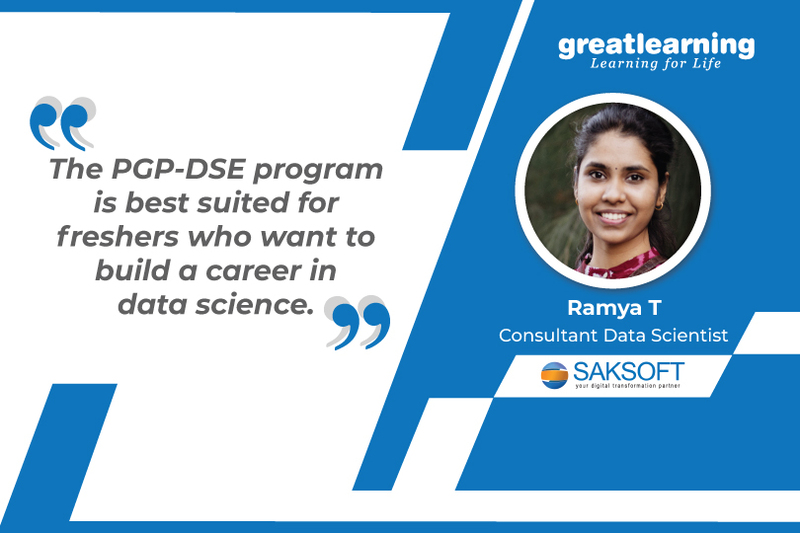 Read further to know why she considered the PGP-DSE program by Great Learning as the ideal choice. I completed my graduation in electronics and communication engineering. After college, I took up a Python course out of my own interest. Later, I decided to take up a full-time data science program; one which would help me to learn data science from scratch. My mother works for Great Lakes and she advised me to take a look at the diverse courses offered by Great Learning. I realized that PGP-DSE is the perfect match for me. The PGP-DSE program is best suited for freshers who want to build a career in data science. I was certain about the quality of the course. I didn’t even consider any other institute and enrolled for the DSE program right away. How was the program curriculum and how is it structured? I got into Saksoft, thanks to the career fair organised by Great Learning in Chennai. My resume was shortlisted by three companies- Monexo, Saksoft, and Merit. After a f2f interview, I got a call from Saksoft for a case study test at their office followed by a rapid-fire round. The data set that was given in the case study round was similar to the classroom project that we did. So, I could do it very well. Also, Mr Hariram, who is a BABI Alumnus had given general interview guidance after my interview session with Saksoft. I got this offer even before completing the program. What kind of career guidance did you get from your mentor? We were properly groomed for the interviews. I would like to thank Mr Shyam Muralidharan who took my mock interview. He was very patient. He gave a lot of tips on how to perform during the interviews and highlighted the areas of improvement as well. I couldn’t have performed well in my Saksoft interview without the mock interview experience. Even after getting the job I chose to take a career mentoring session and I booked my session with Mr Shyam. Career mentoring is a good initiative as it helps students to get guidance on choosing their career path.